An idealized representation of the air temperature as a function of distance from a single-pane window on a calm, winter day is shown in below figure. The window dimensions are 60 cm × 60 cm × 0.50 cm. (a) At what rate does heat flow out through the window? (Hint: The temperature drop across the glass is very small.) 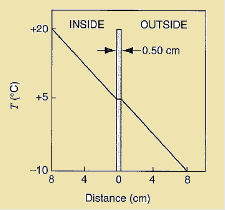 (b) Estimate the difference in temperature between the inner and outer glass surfaces. (a) directly proportional to the area (A) available. (b) inversely proportional to the thickness of the slab Δx. Here, k is the proportionality constant and is called thermal conductivity of the material. (a)To find out the rate of heat flows out through the window, first we have to find out the temperature gradient both inside and outside the window. Rounding off to two significant figures the temperature gradient will be 190 K/m. Similar result will be occur for also outside. Two identical rectangular rods of metal are welded end to end as shown in below figure (a), and 10 J of heat flows through the rods in 2.0 min. How long would it take for 30 J to flow through the rods if they are welded as shown in below figure (b). Here k is the proportionality constant and is called thermal conductivity of the material. As the temperature difference in this case ΔT = Thot – Tcold is same for both the case, thus the thermal conductivity will be same for both the cases. Here W is the energy and t is the time. From the above observation we conclude that, the time t for 30 J to flow through the rods if they were welded in the figure parallel configuration would be 1.5 min. The temperature Tx at the interface of a compound slab is equal to (T1R2 + T2 R1) /(R1 + R2). Here, T1, T2 are the temperature of two surfaces (with T2 > T1) and R1, R2 are thermal resistance of the two materials. Here L is the depth of ice + water and L2 is the depth of ice. Rounding off to one significant figure, the thickness of the ice will be 2 m.